George Michel. 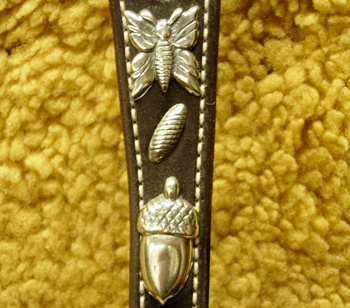 Custom saddles, cowboy trappings, custom silver. Hello friends and welcome to the OXRanch Site! Actually speaking we are located in Fort Bidwell, Calif. That is in the very north east corner of the state, 5 miles from the Nevada state line and 12 miles south of the Oregon border; at the Western edge of the Great Basin. As you can see on the site, it's cowboy country, and cowboy gear is what we supply. If you can't ride out this way, give us a call. 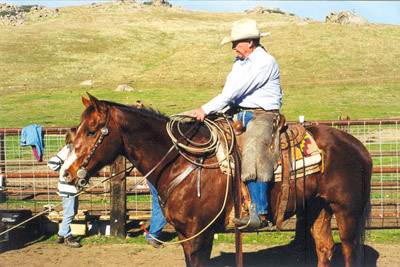 We'll be glad to help you find a saddle that never leaks, or a rope that's always true. And to go to town, we'll dress up your horses with the coolest headstalls in the West, check them out! A Special Thanks to Dan Roberts for singin' to the "little cowboy" in all of us! All photos on this site are © Copyright protected, please do not duplicate. Michelle and George dedicate this site to the old timers who have helped us all. They are gone but not forgotten. George is in the hospital. Don't miss our many galleries; Headstall Gallery, the Saddle Gallery, and General Gallery. Hot Seller: The Austin Roper! Our Custom Saddles Are Guaranteed Not To Leak! We have had over the years the chance to make quite a few saddles for cowboys, cowgirls, ranchers, cowboy kids, and cowboy mom's and granma's too! Want to catch a cowboy? We carry buckaroo bait and horse jewelry — success guaranteed. (Not legal in some states - restrictions apply in CA, NV, OR and ID) Checkout the Headstall Gallery you will find some of the headstalls we have made for our customers; split ears, brow band headstalls, concho buckles, or regular buckle sets. We can accommodate just about every wish! We Rope the West! OX Ranch Rope Shop has a lot of ropes to choose from, with 20 different kinds of rope stocked in 50'! That is about the biggest long rope line-up in the U.S.
Read the Profile of George Michel in Western Horseman Magazine.